Today I made a decision I know I will always regret in a way, but I also know I had to do it. Such a difficult thing: if I hadn't done it, I'd be bitter about the consequences. And if I did it, like I did, I'm disappointed in myself in a way. It's hard to tell whether I'm happy about my decision or not, but there are certainly both good and bad sides to it. It's working towards the future. What I did was I deleted my second character ever, the level 60 human rogue I have mentioned in a couple of posts earlier. She was my first main and I share the most noobish memories with her. 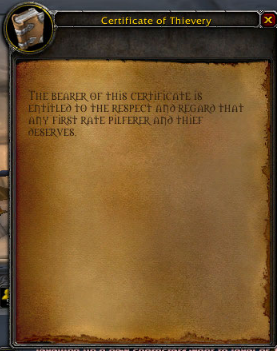 I know that I'll always carry memories with me (except in the case of amnesia, but it seems quite unlikely to me now) - but I can't do the same to the pre-Cata items, some of them rogue-only that she had. Below are examples of those that were (mostly) unique to her inventory, those I don't even have on my main Nicasia, although she was created shortly after Miss S.
I remember Darkshore being all out of cats when I first went there to collect these. 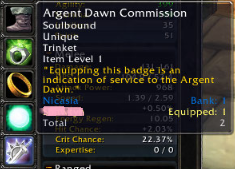 I didn't remember I had this one on Nica, thanks bag addon! Just an item no longer available in the game. This now makes me wonder why I had to delete the first totem Nica had, you know, that "counts as an earth, fire, water and air totem" relic without stats shamans got after finishing their totem quest chains. I even remember the moment I deleted it, and where I stood when I did that: in the trade district bank (remember old bank with the queue ropes?) after I had got Totem of the Thunderhead. Finally, the reason behind S's deletion was simply that I'm running out of character slots instead of ideas for new, inspiring alts. For years I've known that I'll never be inspired to play my first rogue again. I also know I'll have lots of fun with different kind of alts now and in the future. I rarely manage to create an alt I end up playing all the way to the maximum level, but it does happen. And I'm glad to be prepared for being stuck by a great idea for a new character.